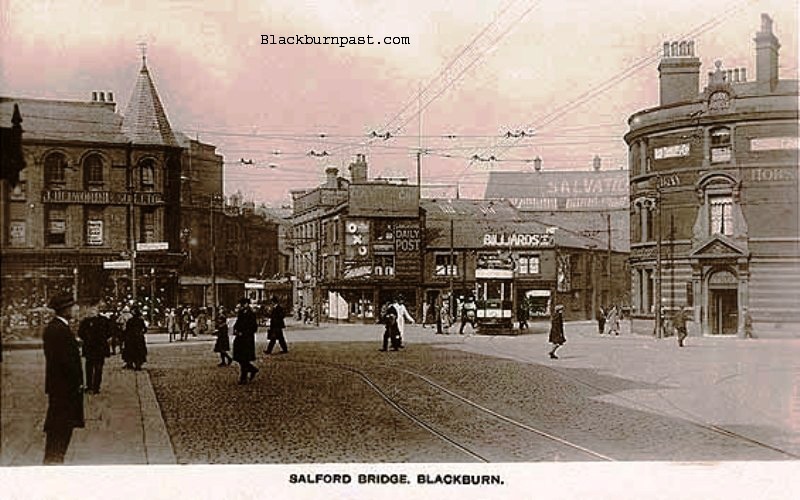 BLACKBURN PAST: Salford from Railway Rd - Mid 1920's ? 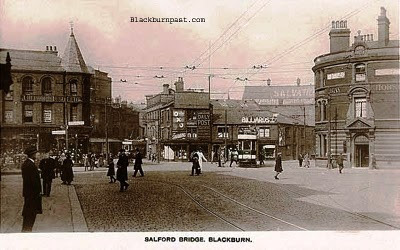 Salford from Railway Rd - Mid 1920's ? A lovely old view of Salford. Looking from Railway Rd (probably Station Rd at the time) towards Holme Street and Water Street, with the Bay Horse to the right of the scene. I like this photo Colin, but thats now't new as you well know that this was (Not now though) my favourite part of the town centre. It's the first photo that I've seen with the old Savation Army building on Merchant St in it. Have you any idea of the date it was taken ? I took this photo myself John. It was October 20th 1919. To be honest, I don't know what year it was taken, but I do know that the turreted building on the corner of Church St and Holme St was demolished in the 1930's to make way for the Woolworths building. Until the early 30's it was the offices of the Tramways Dept, but prior to that it had been a shop (Hepworths I think), which it still is in the above photo. So if you can find out from your directories or some other source when it went from being the shop to being the Tram Offices, we can narrow it down. I think that building only stood for about 30 years, as around 1905 the property on that corner was the ivy covered doctors house. At a guess, I would say the photo dates to around 1920, but it's definitely only a guess. Just had a look in my own directories John and J. Hepworth (tailors) were still operating from that shop in 1928. As mentioned above, I don't know when they moved out and the Tram Dept moved in. Looking at the photo again, the clothes the people are wearing look more mid - late 1920's than my earlier guess of 1920. That Salvation Army building looks to have been a big place. Was it big inside? I'll go with your guess of the photo being taken in the mid 1920's Colin. Blackburn Tramways only occupied the former Hepworth's shop from 1930 to 1935.